There’s lots of talk about the importance of a successful kickoff meeting for a project. What’s equally important is the close-out meeting at the end of a project, as it gives the project team the chance to review their work. The ‘lessons learned’ from a completed project should be archived and serve as a knowledge center for future projects and project teams. As we’ve already established in our blog post on the project management life cycle, a project needs a clear beginning, middle – and end. It’s important to establish a formal project closure to get the final acceptance from the client, and it also serves as an indication to the project team that the project is officially over. You should also use the project closure to get as well as give feedback. In most projects, there will be two close-outs: the administrative close-out and the contract close-out. The administrative closure includes activities such as collecting and analyzing project documents, assessing the scope and the deliverables, analyzing the project’s success, and creating a final project report. The contract closure includes making sure that all criteria for a project closure are met, i.e. that the final product or service was delivered and is to the client’s satisfaction, i.e. verifying that the deliverable meets the contract terms. The report should capture: what went well, what were the challenges, the lessons learned, recommended future actions, and any information you think would be helpful to future projects and teams. Not obligatory, but a good addition: moderator/facilitator who is not directly involved in the project. This will ensure a structured meeting procedure and also the necessary objectivity to lead the meeting effectively. 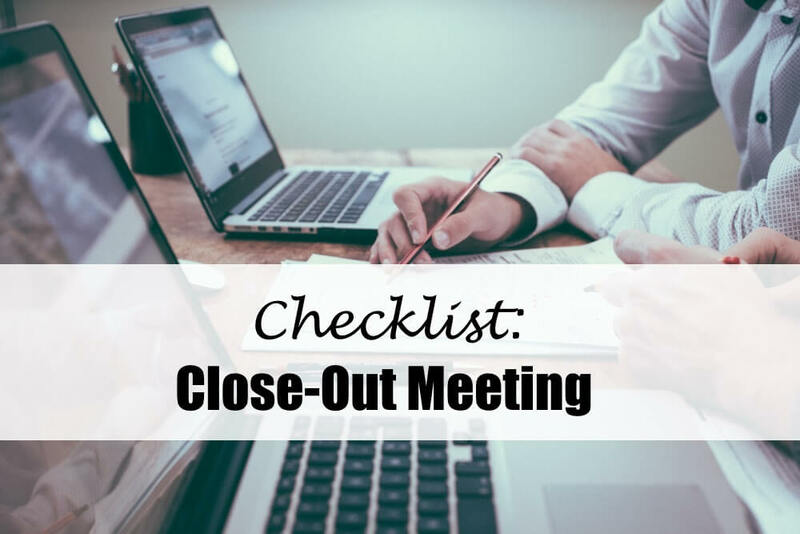 The close-out meeting should be planned right from the beginning, or at least early on. It should even be included as part of the project deliverables. It’s important to hold the meeting very soon after the team has finished the deliverables. Prepare important project materials, e.g. project plan, project scope and requirements specification statements, relevant data analyses, budget reports etc. How can we replicate the successes in future projects? What challenges did we meet and how did we manage the challenges? How could we have managed the challenges better? Did we stay on budget, scope and time? How much did it deviate from the project plan? Did everyone know exactly what their responsibilities and role was? Did we assess and manage risks effectively? What risks and changes did we fail to anticipate? How can we assess unforeseen events better? How can we used the gained experience and knowledge for future projects? What recommendations can we give future projects, managers and teams? Identify areas for improvement, lessons learned, recommendations for future projects etc. Evaluation of project success: by looking at planned and actual deliverables, comparing achievements with the project’s objective, indicators such as quality and ROI. What can be improved, e.g. processes, methods, strategies, productivity etc. Check List Close-Out Meeting: Completing a Project Successfully - InLoox • Copyright 1999-2019 © InLoox, Inc. All rights reserved.